The Honda CRF100 parked up in front of me is almost laughable. It’s the sort of bike I’d consider buying my one-year-old son in the vague hope that he will learn to ride before he walks. But point this 9.5hp mean machine towards the dusty shale surface of an oval Flat Track course and it suddenly turns into an intimidating handful. 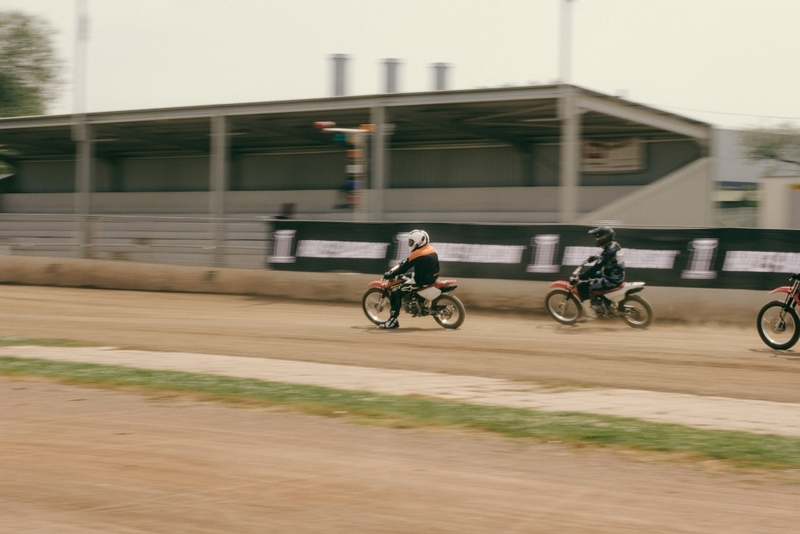 I’ve travelled to the rustic but charming speedway track at Rye House Raceway on the outskirts of London to try my hand at a motorsport that has gripped the trendy biking fraternity. The training will eventually manifest itself in a fully fledge race at this year’s DirtQuake event in Kings Lynn, one of motorcycling’s best kept secrets and an event that fuses custom bikes, off-road racing and a bunch of complete lunatics decked out in fancy dress. But more of that later because right now, I have the unenviable task of coaxing a small motorcycle around a dry and downright dangerous track without breaking bones. 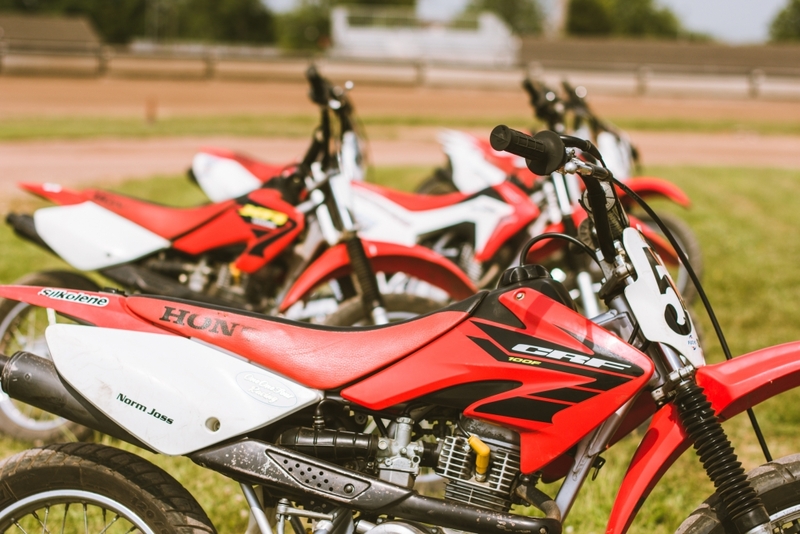 There are some question marks over the origins of the sport of Flat Track racing, with some suggesting that it first sparked an interest from Australian fans in the 1920s, while others argue that Harley-Davidson and Indian Motorcycle helped propel the it into the mainstream a decade or so later. Regardless of your historic standpoint, there is no denying that the sport is beautifully simple. 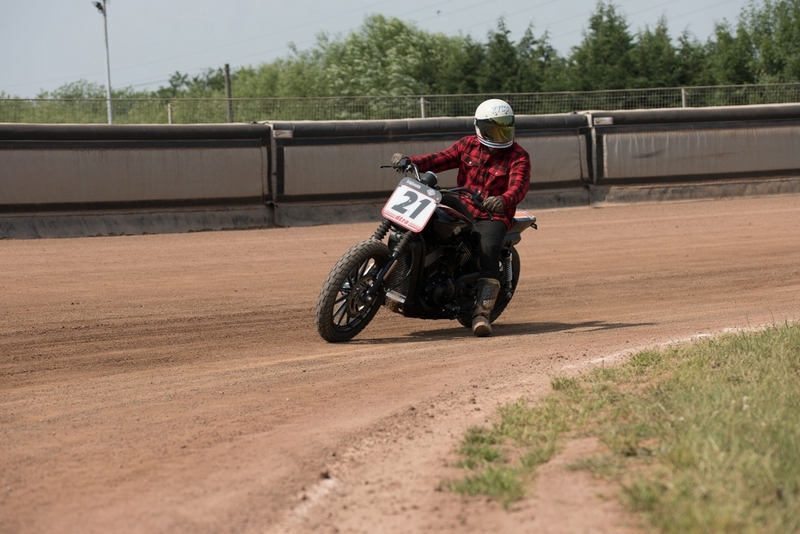 Today’s Flat Track action sees bikes run chiefly stock two or four-stroke engines, albeit with some fettling for racing, on low-slung dirt bike frames that do away with the front brake in favour of just a rear. 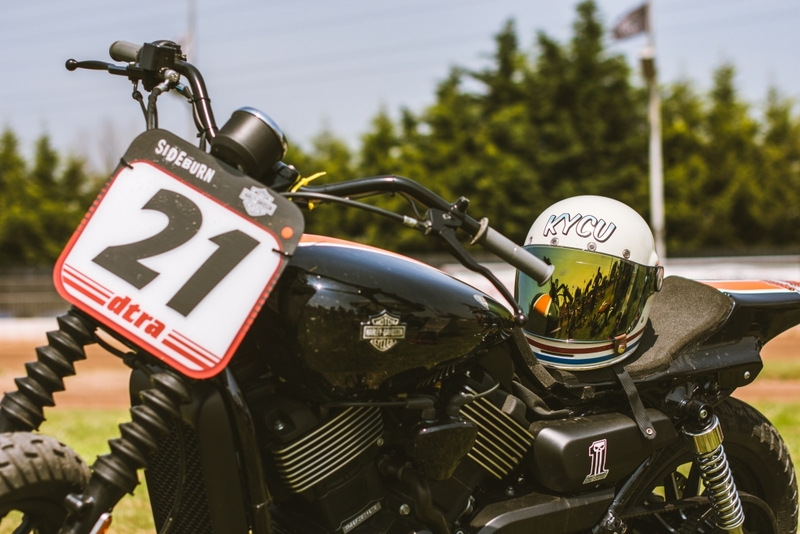 Bars are wide to allow riders to apply plenty of opposite lock but it is this rear brake that sets it apart from Speedway, as Flat Track riders must perfect the art of ‘backing in’ if they wish to succeed. Here, the rear anchor is applied while leaning the motorcycle into the left-hand corner in order to convince it to turn when gravity and the laws of physics are attempting to lay it on its side and send the rider sliding towards a wall at speed. 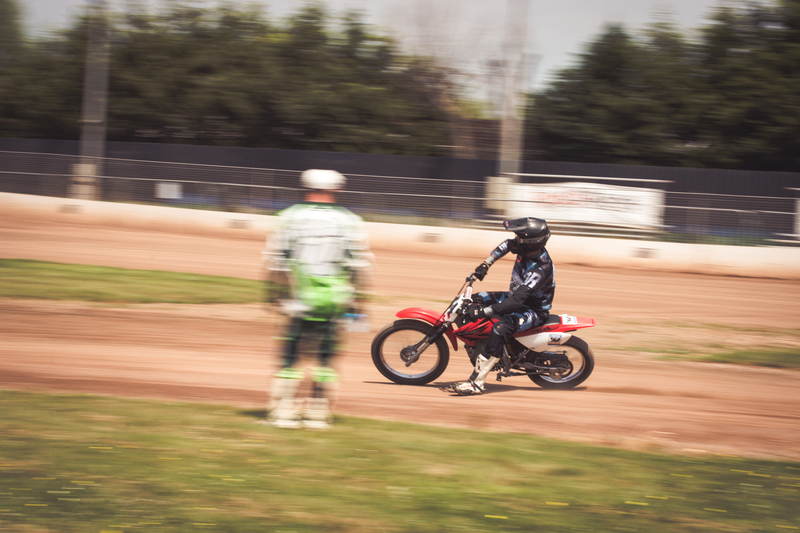 According to Peter Boast, our instructor for the day from the brilliant Champions Flat Track School, many MotoGP riders enjoy mastering this dirt-based discipline, as it helps fine-tune throttle control, as well as providing some skilled rear braking methods that can now be seen throughout the racing world. It soon becomes clear that this isn’t a sport that takes itself too seriously. 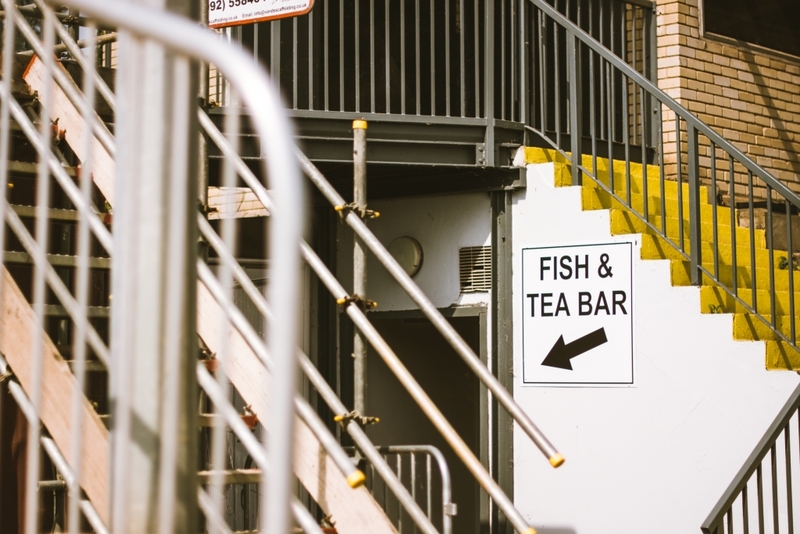 The day is fun, light hearted and easy on the health and safety regulations. The main aim here is to get newcomers involved and hooked on the art sliding. 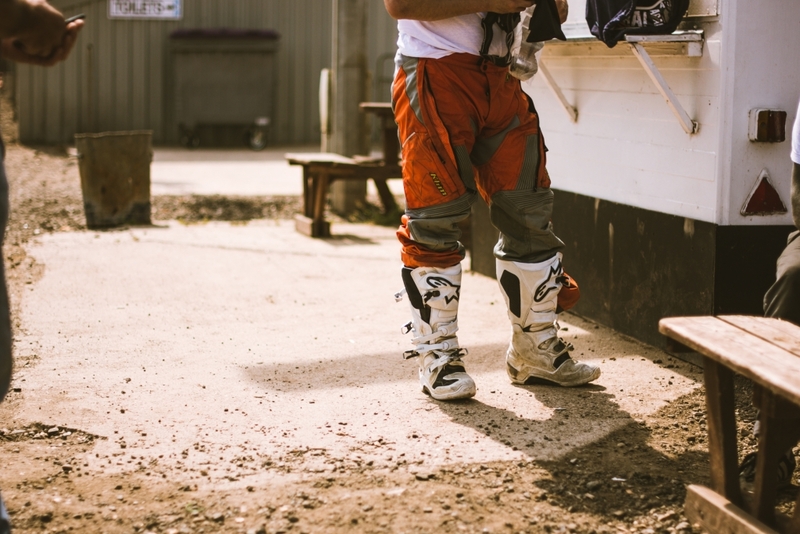 As such, the dress code for today is fairly relaxed, with an attitude that suggests any motorcycle gear that’s good enough for the road is good enough for Flat Track. That means I’ve turned up to the day in a pair of black Resurgence Jeans, fashioned from protective Pekev material and packing built-in armour, a Richa lumberjack shirt, again with armour, and my trusty Bell Bullitt lid. It is 35-degrees outside and I’m already regretting the shirt, but to make matters worse, I forgot to pack any suitable footwear. Safety rules are fairly relaxed but the pair of old Converse I’m wearing quickly receives a disapproving glance from supervisors. Luckily a member of the Harley-Davidson team, our hosts for today, lets me borrow a pair of old Speedway boots that belong to his father in law. However, there is one essential piece of equipment for Flat Tracking that is rapidly thrust in my direction and that’s a steel shoe, which slips underneath the left boot and is held on by a pleasingly rudimentary cable tie. 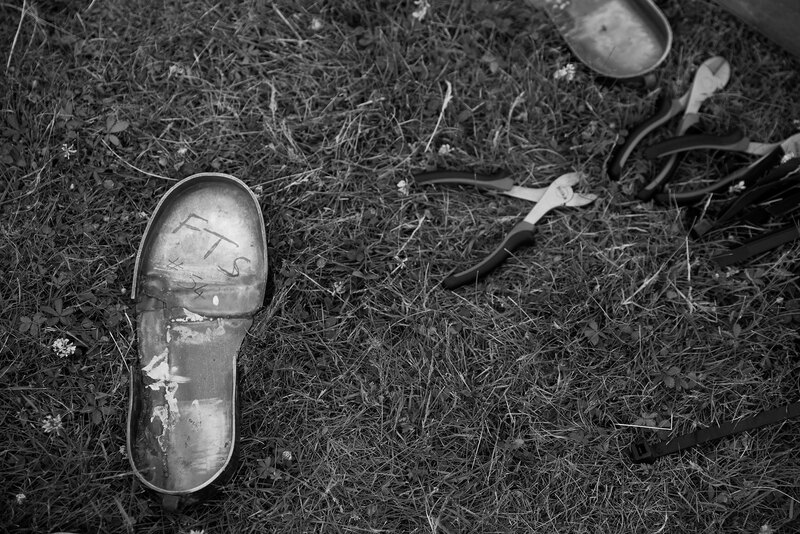 The reason for that steel boot soon becomes apparent. Pete Boast starts the day by judging our overall off-road riding ability. 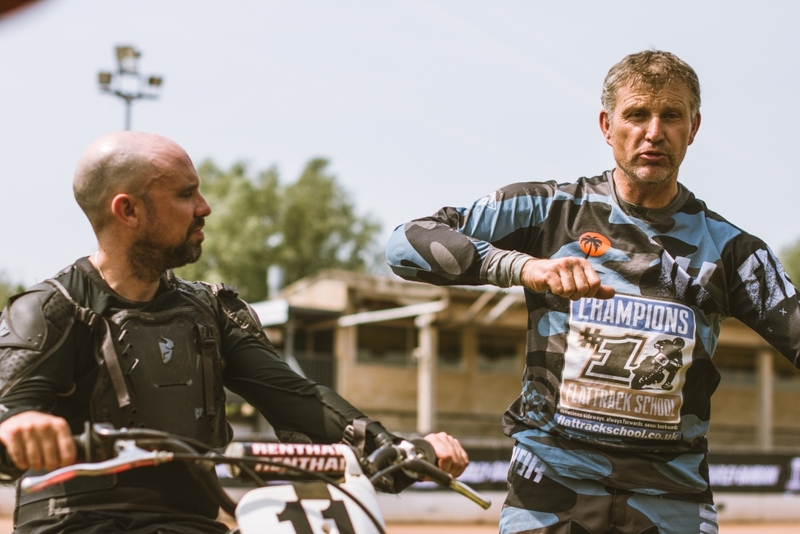 A few cones are laid out in a slalom course and we are encouraged to navigate them while sitting forward on the bike, elbows high, knees tucked into the tank. 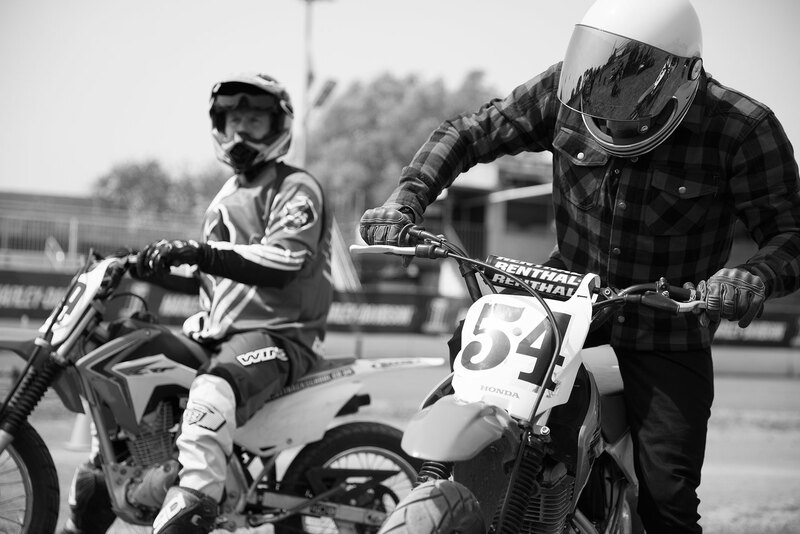 Steering is taken care of by pushing the handlebars hard down towards the ground, leaning the small machine at unnerving angles until the wheels feel like they are about to wash away, while the upper body remains as central over the seat and upright as possible. Some previous off road experience comes flooding back to me and I instinctively begin to stick an appropriate leg next to the front forks for security. I’m soon told by the course instructors that it’s a good effort but not entirely correct. 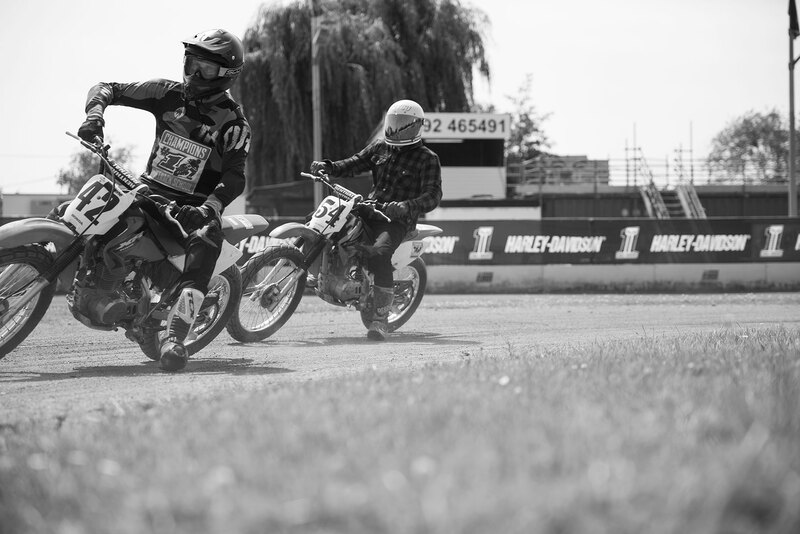 In Flat Track racing, the metal-shod left boot acts as a third wheel, so rather than merely dangling it next to a front fork, it is stuck out wide, the toes pointing to the 10 o’clock position. The knee remains bent and the bike is leant over at a frankly scary angle, with all stability resting on this fleshy appendage. It’s amazing the extent of lean you can get a machine to commit to when a metal left boot is acting as a stabiliser. But perfecting this method is tough and the main goal of any burgeoning Flat Track rider is to maintain speed through corners – the bike locked in a drift that would excite professional Rally drivers, the rider feathering the throttle until he or she can sense enough grip to accelerate out of the corner. Once Peter is happy with progress, he lets us loose on the full circuit, which has been freshly watered to prevent the surface from becoming a giant dust bowl. It is also advised to completely ignore the front brake lever, as grabbing a handful of this is a sure-fire way of eating gravel. So, the order of proceedings is thus: apply full throttle along the straights (until the little Honda is nearly bouncing off the limiter), hard on the rear brake when approaching the corner (trying not to lock the rear wheel entirely), heavy on the left handlebar so it is grazing the ground, left leg out wide and round we go. The rear kicks out and it is a natural reaction to apply lots of opposite lock on the bars. Speed may be relatively low but navigating the slides feels awesome. It’s instantly addictive. Overtaking opportunities are scarce (particularly on these lower powered machines), so it is a battle of wits and courage to climb the places – who can brake latest, who has the confidence to overtake up the inside while sliding, who can find the most grip upon exit. The day concludes with a quick blast on a Harley-Davidson Street 750: the bikes we will be riding at the DirtQuake event in Kings Lynn on July 7-9. Piloting these heavy beasts is an eye-opener and even our professional colleagues struggle to wrangle the things around the slippery circuit, but it is fun trying nonetheless. 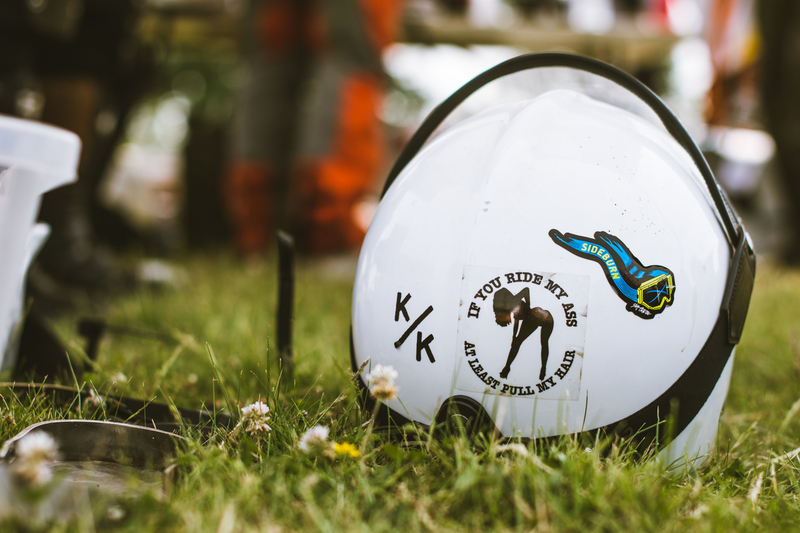 And that’s the point of this bizarre, counter culture event, where completely inappropriate vehicles tackle the DirtQuake course for little more than the belly laughs and camaraderie provided by the festival. Am I ready for a real competitive race? Of course not. Will it be absolutely hilarious trying? Yes it will. I just hope Harley-Davidson has a good insurance policy and I remember to pack some boots. A big thanks to Harley-Davidson for entrusting us with one of their machines. Resurgence Gear for the Skinny Leg Black Cafe Racer Jeans (£199, Motolegends.com) and Richa for the Lumber Shirt (£119.99, Nevis.uk.com). Of course, this feature was powered by Jimmy’s Iced Coffee #KYCU.